I’ve wrestled with my fair share of picture book manuscripts. A “brilliant” idea at 9 a.m. that falls apart by noon. That wonderful first sentence that pops up while making coffee, only to fade to confusion an hour later in the shower. An entire book theme that carries through perfectly, until the very end—when it makes no sense at all! Yet, when the difficult stage of writing any picture book comes (and it ALWAYS comes) it’s like I’m struck with amnesia. Each time I feel like I’m out of my element. I don’t recognize this as a normal, creative stage. Instead, my brain screams, “I can’t do this!” and I have no confidence it will ever get better. True confession: I’m in that stage on a new project now; and have been for about two months. Building picture books might look easy; but it’s messy, like a sculpture made from random objects. Honestly, it’s a lot like the sculpture featured in my new book, The Secret Kingdom: Nek Chand, a Changing India and a Hidden World of Art, illustrated by Claire A. Nivola. The Secret Kingdom is the story of Nek Chand, a boy who grew up in rural Punjab and was forced to flee during the partition of India in 1947. Nek remembered his home village: the stories that were told, the way it looked, and the people he loved. Due to politics, he couldn’t go back to village life, and spent the rest of his life near a big city. He worked as a road builder, had a family and friends, but often felt out of his element. 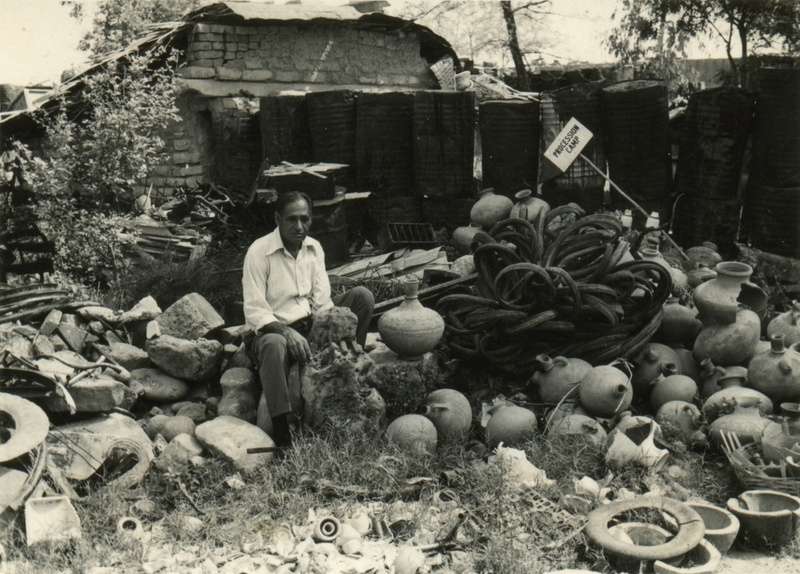 Without really knowing why, Nek Chand began picking up discarded pieces of village life that he found while digging roads: broken pottery, stones, bangles, fabric scraps, used hardware, bicycle parts, and more. He carried all these materials to a clearing in the jungle. He didn’t start with a grand plan, he didn’t know he was becoming an artist, he just began feeling his way home. He put pieces of “junk” together into mosaic sculptures that he found beautiful. He kept his work secret for fifteen years, so it wasn’t meant for anyone else. I’m sure some days he couldn’t work at all. Other days he took apart what he’d just put together. He worked in one direction, then veered off in another. His concrete wouldn’t set. It rained. A sculpture’s frame rusted. But making things nourished him, building his own place allowed him to fit in, and art became his new home. Over many years, he built the magical Rock Garden of Chandigarh—at more than 25 acres, one of the largest art environments on the planet. Nek Chand’s process is exactly what building a picture book is like; especially on days (or weeks, or months) when it’s not coming easily. It’s picking up and putting down pieces of research. It’s turning words over, throwing them out, picking them back up, stacking them differently, and paring them away. It is active and physical. It is so much like sculpture that when revising a picture book idea, I’ve literally found myself rubbing my fingers together, or curving the length of the word I need in the air, as if conjuring a material object. Not exactly writing a story; sculpting one. I obviously finished the manuscript that became The Secret Kingdom. And I will someday finish the story that feels impossible right now. Each in its own time. It can’t be rushed, it happens when all the pieces arrange themselves into something beautiful. All we can do is show up and keep building. Barb is celebrating two book birthdays. One for The Secret Kingdom: Nek Chand, A Changing India and a Hidden World of Art, illustrated by Claire A. Nivola, published by Candlewick Press. The second for Blue Grass Boy: the story of Bill Monroe father of Blue Grass Music, illustrated by Edwin Fotheringham, published by Calkins Creek. If you’d like a chance to win an autographed copy of THE SECRET KINGDOM and BLUE GRASS BOY, just leave a comment on this post. Winner will be selected March 20th! Barb Rosenstock loves true stories best. She’s the author of award-winning nonfiction and historical fiction picture books including the 2015 Caldecott Honor book THE NOISY PAINT BOX, illustrated by Mary Grandpré. 2018 titles include: BLUE GRASS BOY with Edwin Fotheringham, THE SECRET KINGDOM with Claire Nivola, OTIS & WILL DISCOVER THE DEEP with Katherine Roy and THROUGH THE WINDOW with Mary Grandpré. 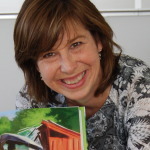 Barb Rosenstock, nonfiction picture books, picture book biography, writing advice, Writing inspiration, Writing Picture Books. Bookmark. Have you been to a bookish baby shower? I love your descriptions about sculpting a story! That’s exactly what we do, with some oops and ahhhs along the way. I’m inspired to keep sculpting (just this morning I told myself, ugh, I can’t do this!) Thank you! Congratulations on both of your book birthdays! None of us feel we can ever do it, until it’s done! I loved BLUE GRASS BOY and look forward to reading more of Barb’s books. Wonderful description of how messy writing a picture book can be – thank you, Barb, for the inspiration to keep going. Looking forward to reading your books! Happy Book Birthday X two! If I win, BLUE GRASS BOY will go to my father-in-law, who loves the musical heritage you write about. Such a wonderful analogy. I often print my stories so I have a physical form to chop up and move around, to touch and hold. I look forward to The Secret Kingdom. Yep! I do this too! I read an article about Nek a while ago and found his story interesting. It’s so cool to see that kids (and adults) will get to read about him in your picture book. I love real life stories. Such a great description of how a book (finally!) comes together from all those bits and pieces! 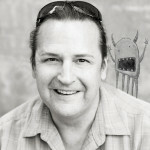 Love the concept of “sculpting” a story — interesting post! THE NOISY PAUNTBOX is one of my favorites! I too love non-fictional n and look forward to all of your new books! I’d love to learn more about your research process. Your post has come at a momentous and messy time in a story I am “sculpting,” and “sculpting” is such an apt way of looking at this process. Thank you for your words. They inspire me to keep picking up the pieces and curving and shaping the lines. I can see why you were attracted to Nek Chand’s story. Congratulations on your two new pieces of art! Thank you for this timely reminder that I’m not alone in the messiness that will hopefully become something beautiful one day. What an amazing story! I’m looking forward to reading The Secret Kingdom. And, I appreciate the comparison of writing to sculpting. Barb, love your picture book biographies-such a great way to introduce important people/ideas to the young ones! This is a fascinating story! I can’t wait to see your book. Now I’m going to go google Nek Chand! Make sure to look at ALL the photos! I love this, Barb! I can’t wait to read your story! I’ve seen my process, or lack of it, reflected in a few stories I’ve written. I think everything we dive into has lessons for us as writers. So basically, it never ends until we do! 🙂 Thanks for sharing!! Really love the range of what you’re writing. I loved the Nek biography–so happy to know of him and the illustrations were a lovely match to your lyrical voice. I Just read Otis and Will which was also a great book, but so different in tone. Loved the drama you gave their “down, down into the deep” adventure! I think it’s a gift to be able to match voice to subject as beautifully as you do! It’s good to hear that even the seasoned writer gets stuck now and then. And a good reminder that things will come around. Thanks for the post today. I would love to win copies of these books. I’m familiar with Nek Chand’s sculptures. I look forward to reading your well structured picture book. Happy Book Birthday – times two! I love the analogy to sculpting. 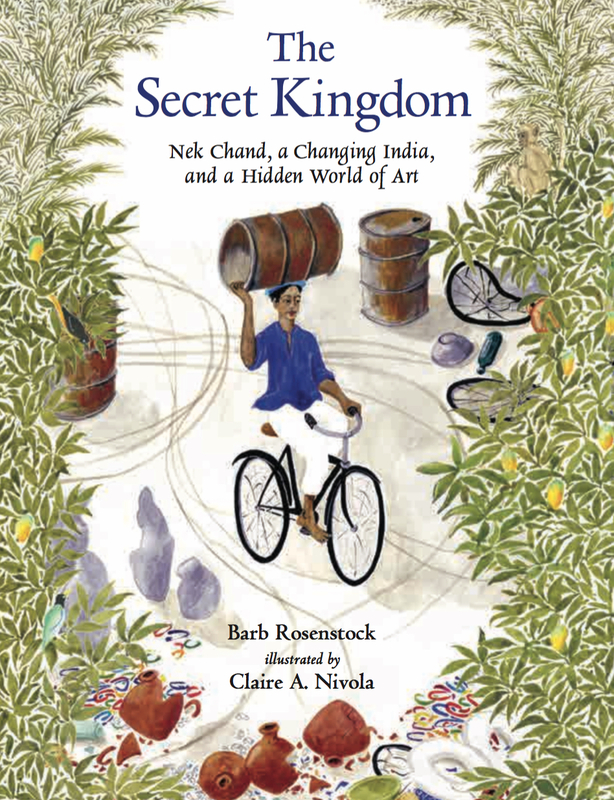 I look forward to reading about Nek Chand in THE SECRET KINGDOM. It’s helpful to know I’m not the only one who struggles with the next sentence, a struggle that can turn into years. Thank you. Barb, I can’t wait to read this! Congratulations! Beautiful story, Barb! I love how sentences pop up in your head the same happens to me especially when doing the dishes!Happy book birthday to you! Greetings from Greece! Thank you for sharing your knowledge and an added bonus of sharing a story about an artist I would never have known about otherwise. I’m off to look for your books. thank you. Please do look at Nek Chand’s work. A beautiful example of a refugee making a new place home through art. You are so right about writing PBs being messy. I know what it’s like to have an idea one minute and be lost through the simple act of getting up out of a chair! The Secret Kingdom sounds so interesting. I look forward to reading it. Thanks for sharing your thoughts on the messy business of sculpting picture books, Barb. I hope the “impossible” project you mentioned comes together. In the time since I wrote this post, it already has! You guys are good luck! This story sounds wonderful — looking forward to reading it! The Secret Kingdom has really caught my attention. What an intriguing story! “All we can do is show up and keep building.” Love this advice. Thank you for the encouragement. The analogy between creating a picture book and “a sculpture made from random objects” was perfect. I can totally relate to the line, “That wonderful first sentence that pops up while making coffee, only to fade to confusion an hour later in the shower.” I especially loved how you said that “Building his own place allowed him to fit in.” Perfect!! Is anyone else thinking that each of those amazing lesson plans from those equally amazing student teachers should be snatched up by a publishing company and turned into books?? I think 60 minutes should do a story on them, as well. Kudos!! Wonderful post! I love reading your wisdom, Barb. I’m working on my first nonfiction manuscript and have used your books as mentor texts and have read some other blog posts you’ve written and some interviews. Very helpful! I’ve definitely felt the “I can’t do this!” moments, but my sculpting continues. I’m looking forward to reading both of your new books! Well, there are not many days I feel wise, so thanks for this! Barb, You won me over with The Camping Trip that Changed America. I would love to read these two latest books. I don’t doubt that they are just as wonderful!! Thank you for the reminder to be patient and persistent with the process. I was so excited by an early draft of a picture book and pulled it out only to wonder “what is this mess?” I know that there is something in it, but that I will have to keep working to make that something shine. Sculpting is the perfect metaphor for PB writing! Love your books so much, Barb. I especially loved Dorothea’s Eyes–so lovely! I absolutely cannot wait to read Through the Window since I’m a Chagall fan. The cover is amazing! Otis & Will also looks like my kind of book. Looking forward to The Secret Kingdom & Blue Grass Boy too. Congrats to you!! This is a wonderful post about sculpting a book! Thanks for sharing. Yes, I know this process well, especially the messiness and self doubts. Nek Chand sounds inspiring–I look forward to reading about him. Congrats on the new book–looks like a beauty! Very interesting. Thanks for your post. What a beautiful metaphor for creating a story. And I cannot wait to read about Nek Chand! Congratulations and thanks for the reminder to persevere. I love this! 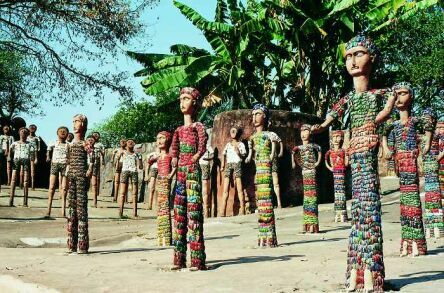 What a wonderful story about Nek Chand! I can’t wait to read your new book and share it with my students! My ideas for writing always come to me in the shower, in bed, or right before one of my kids needs my help–any time it is not easy to make myself write them down! Writing is very much like sculpting. I like the analogy. Thanks for sharing! I’m always glad to know I’m not the only one who struggles to make the writing come out right. Thank you, Barb! I love your sculpting analogy. It puts a picture with the process. thank you so much! Your analogy is apt, especially the parts about occasionally meeting disasters/impossibilities you don’t foresee and the shaping with words (sometimes even letters and syllables in the case of poetry)–the tinkerings that few if any readers suspect. Thanks!